Ever since Neil received his two bread baking books at Christmas time he has been addicted to baking and it has been wonderful to have a baker in the house (I’m not really one). One thing we have been making lately are homemade pizzas but unfortunately we don’t have a baking stone so although the pizzas are tasty they just weren’t as crisp on the bottom as we would like. Finally last week I bit the bullet and bought Neil a new Emile Henry Baking Stone and as soon as it arrived we new we had to make pizza. 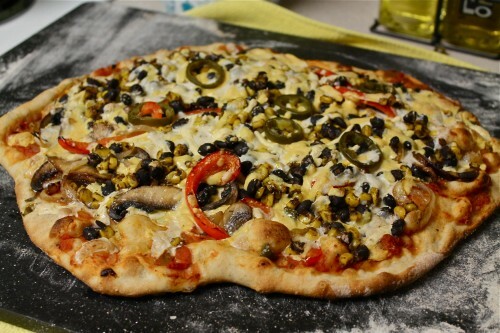 In honor of Cinco de Mayo we made a Mexican inspired pizza that was topped with Galaxy Foods new vegan Mexican Shreds (disclosure: I received the shreds free from the company to try out). I have to say I loved the shreds and the melted so well on the pizza. I am really weird about vegan cheeses and although Daiya, Cheezly and Sheese are all okay I’m still not much of a fan and often just make my own cheese sauces via nutritional yeast and nuts. Galaxy Foods has been the only vegan cheese that I actually like and so I was excited to try their new shreds, which were tasty, melty and perfect for pizza (and a baked pasta dish I’ll blog about later). Preheat your pizza stone in a 550F oven for 30 minutes. 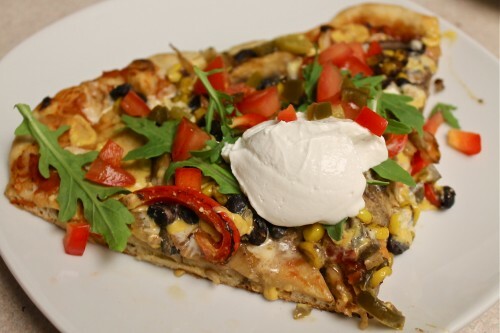 Roll out your dough and top with salsa, veggies, beans, corn, jalapenos and cheese shreds. Place on the pizza stone and bake for 8-10 minutes until browned and bubbly. To serve top with a sprinkle of baby arugula or shredded lettuce, fresh chopped tomatoes, more pickled jalapenos and vegan sour cream. I didn’t like the “mouth-feel” of Daiya shreds. I’ll give Galaxy’s a try on your recipe. Yum! 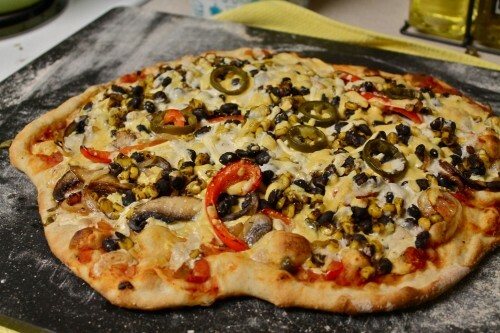 We made this Mexican pizza tonight and really enjoyed the toppings. lol. The VegWeb crust recipe I tried was a bum one but your part of the recipe was really good! We’re definitely going to try it again with a different crust.